One of our licensed Plumbers will come out and unblock your blocked drain from only $96.00. Simply call us on 1800423378 and mention APG96 or fill in the booking form below. 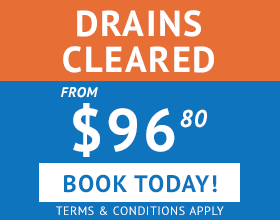 Important:The $96.00 offer is to clear the drain utilising a plunger or hand rods and if the work takes longer than 30 minutes or needs more equipment, an upfront price will be provided for the additional works before we proceed. From our experience, a large percentage of pipe blockages are simply hair or toilet paper or other blockages that have not damaged the drainage system. Our drainage team carry with them all the latest equipment including drain cameras and drain jetters or eels to resolve more complicated problems. This is a domestic offer only. This offer is not applicable with any other offer. This offer applies during normal hours only. The home owner must be present. This drainage offer is only redeemable on residential blocked sewer drains through an accessible outdoor clean out. Further work after the first 30 minutes will incur additional fees. Our full terms and conditions are straight forward, but if you have any questions please give us a call or drop us an email. We have highlighted the main bullet points below. The biggest problems occur from a lack of access. Good examples are locked doors in multiple occupancy homes or a leak traced to another property or area we have no access to. We need to ‘see’ the maximum area of floor possible; these areas need to be as uncluttered as possible. We only undertake destructive access under instruction. Method of detection is at the discretion of our engineer. We will try to work around limited access, heavily cluttered areas, refusal of methods or refusal/lack of access may result in our engineer being unable to conclude his work & our full fee will be due. In multiple occupancy property (shared accommodation or flats) we may need access to the adjacent property(s). Where this access is not possible, or the leak is traced to beyond the client’s property, this will be a chargeable leak detection visit. 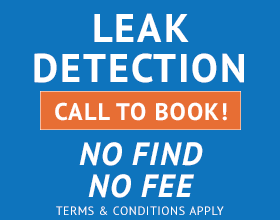 Our ‘no find no fee’ leak detection is per visit for domestic customers only for leaks on hot/cold pipework and water mains, it excludes commercial leak detection as well as damp/roof investigation and swimming pool leak detection. For successful location of a significant leak, where we suspect more leaks are present we will attempt to detect these, however the first leak may disguise additional leaks. Additional visits if required, are charged at the current rate, but we will try to identify everything in a single visit. Repairs are an additional cost, we will advise on the cost and if the repair is permanent or temporary. 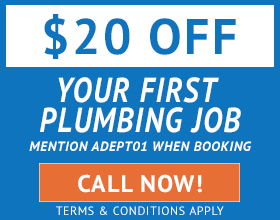 Materials remain the property of Adept Plumbing and Gas until invoice is paid in full. Repairs carry a 100-day warranty, unless stated as temporary. Using a range of equipment, we will localise a leak to a specific area; there are certain limits to non-invasive methods and materials can shift detection results and may enlarge the area of repair to both pipe work and flooring. Ducting, sheathing and glued vinyl can block trace gas leak detection. In the case of a floor covering over a solid floor blocking access, we will endeavour to localise with other methods (damp, thermal, acoustic). In the case of a sprung floor we can locate a room or area of the leak, as the gas used will spread in the void localisation is much harder. Using thermal and sound equipment we will endeavour to reduce this area. Leak detection is also considered successful where we find no leak is present (e.g. after incorrect or mistaken water authority notification). Damage during normal activities, to detect, access and/or repair a leak. Damage caused by undetected leaks. Failure of a repair connected to existing pipework. Blockage/failure from leak detection, access or repair. Second visit is arranged within 14 days of original detection.Damage during normal activities, to detect, access and/or repair a leak. If our findings are proven incorrect (within the limitations of section 6) there will be no charge for this second visit, if we still fail to find the leak, we will refund our original fee. However if a leak is found to be in the same leak location, re-attendance is chargeable at the same rate as original leak detection. Where a repair is made to an indicated area and there is further leakage found not to be from the original location (a different, concurrent or subsequent leak) re-attendance is charged at the standard rate.